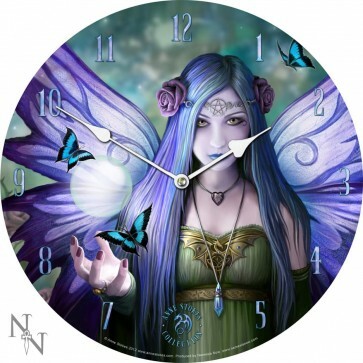 It's always a magical time with this luminously intoxicating wall clock which features an ethereal fairy surrounded by blue butterflies! It's always a magical time with this luminously intoxicating wall clock which features an ethereal fairy surrounded by blue butterflies! The pixie has violet wings and purple and blue hair to match. She wears a sage green dress with a Celtic knot dragon, and two necklaces. A pentacle circlet crowns the fae's head, as well as two pink rose blooms, and a glowing orb rises above her hand.